For 16-year-old Krissauna Austin, walking down a runway is one of the last things she would envision herself doing. 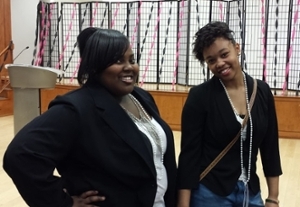 But following the Flawless Young Ladies Conference, the Southern Illinois University Edwardsville’s TRIO Upward Bound student strutted down the cat walk, wearing a big smile and exuding self-assurance. Austin and approximately 40 Upward Bound BEM (Belleville, East St. Louis Charter, Madison) and EC (East St. Louis and Cahokia) high school students participated in the Flawless Young Ladies Conference May 2 at the East St. Louis Higher Education Campus. The conference included workshops, a featured speaker and a luncheon. Motivational and self-help speakers encouraged the students to be their best possible selves. Gina Walker of East St. Louis, CEO and founder of Inspired Inc., was one of the workshop presenters. In her class, “Removing the Mask” she had participants look at themselves in the mirror. “I saw things I didn’t like, and some things I did like,” Austin said. “I didn’t like the dark circles under my eyes. I saw a lost girl because of the obstacles in my life right now. Austin added that she had planned to go to college, but now realizes she will have to work hard to make it a reality. She attended “Women’s Survival Kit for College,” taught by Samara Chapple, of the SIUE East St. Louis Center Director’s Office. Utilize support services on campus such as counseling, study groups, tutoring and workshops. Create a doable class schedule and go to class! Speak in class. Do not be intimidated if you do not know the right answers. It is the process of finding the solution that is important. Working with Banks were also Upward Bound staff members: Janell Smart, counselor; and Pam Morton and Kraig, both teachers. Upward Bound helps youth prepare for higher education. Participants receive instruction in literature, composition, mathematics, and science on college campuses after school, on Saturdays and during the summer. Upward Bound is committed to developing a program which will excite, motivate and prepare high school students from the program’s target areas. The quality services provided will prepare the students for successful high school completion and entrance into post-secondary programs. It is designed to serve low-income and/or potential first-generation college students.